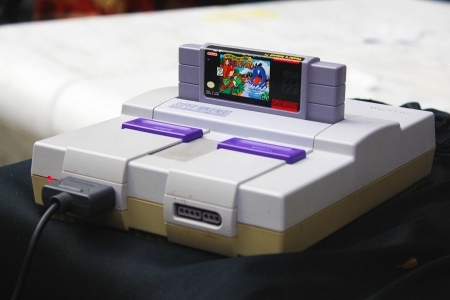 Ah, the Super Nintendo, aka the best darn video game system known to mankind. As you may or may not know, I am not only a big fan of video game music, but I also do some remixes from time to time (such as the BIT.TRIP remix featured in our podcast) as well as write my own music. I am currently in the midst of creating a video game soundtrack for a game that does not exist anywhere outside of my head. Well, I’m calling it a soundtrack, but it might just end up a mishmosh of semi-related, sort-of-gamey-sounding music. We’ll see. While writing this so-called soundtrack, I’ve been thinking a lot about what “video game music” means, or to be more precise, what it means to me personally to think of myself as a “video game musician”. In the 8-bit era video game music was limited heavily by hardware (check out my Top 10 NES Original Soundtracks (OSTs) here! ), and the result was a distinct sound that could be instantly identified as video game music. The 16-bit era introduced better hardware, opening up more possibilities, but the resulting music still generally had its own sound. However, that hardware limit no longer exists (for the most part), and we are seeing all kinds of music popping up in video games, from classic chiptune sounds to sweeping cinematic tracks to rap, rock, electronic and anything else that the minds of musicians can imagine. Has video game music lost its identity? It seems to me that the only thing that defines video game music in the current gaming era is that it is music that appears in a video game. Yes, this is pretty much the best video game system ever made. I suppose that I still have a sense of there being a specific “video game” style nonetheless, even if it is not as concrete as it used to be. Personally, I draw upon a wide range of music when creating my own, and my major influences include punk rock, electronic, piano pieces, and yes, of course, retro video game music. I like to think that my music is more along the lines of the direction video game music would have went towards if it had not turned so cinematic (not that there is anything wrong with cinematic game music, but it generally can’t stand along with retro game music for my tastes.) What does this long and boring story have to do with my top 10 list? Well, when all is said and done, 16-bit video game music, specifically that of the Super Nintendo, is probably my biggest musical influence. Period. The 8-bit era had some awesome music, no doubt, and it is no surprise to me that when musicians look to retro video games for inspiration, they tend to look at the 8-bit era first and foremost. But much like with visuals, gameplay, controls, etc. I really feel like the 16-bit era was everything that the 8-bit era was and then some, and that is where the bulk of my favorite video game soundtracks come from. So in making a list of my top 10 Super Nintendo soundtracks, you’re not just seeing a list of soundtracks that some nostalgic gamer is throwing together years after the fact, you are seeing a list of soundtracks that a musician has drawn upon heavily over the years, and that have never stopped influencing him deeply at his creative core. Neat! Before we start, I have a self-imposed rule for this list; I will only choose one soundtrack per franchise. Otherwise a few key franchises might overrun the entire list, and that would not be fun, would it? I’m also choosing one song to post with each soundtrack, but this is not a best songs list, it is a best soundtracks list. The song is meant only to give a taste of what the soundtrack has to offer. Is this going to be my controversial choice? I really don’t know. Lemmings is one of my favorite action / puzzle games, and with 125 stages (SNES version) to play through, it definitely has enough content to keep gamers satiated. The soundtrack has a fair bit of variety, from happy songs to scary songs to... remixed public domain songs? It was the emotional songs that took me by surprise though; this was not something that I expected to find a colorful little puzzle game. I’m sure no one is surprised to see this game on my list, although you may be surprised that it isn’t closer to the top. What can I say, I missed out on this game at the time, and didn’t play it until many years later, so it never quite stuck with me the way some other SNES games have. Still, the soundtrack made an impression, and it has everything from energetic battle / boss themes to tear-jerking dramatic themes that scream out “epic”. The song I picked is a battle theme and probably one of the most renowned Final Fantasy songs, and for good reason. This is a great example of good old fashioned excellent song-writing. I think that a lot of people may be expecting the Super Mario World soundtrack to represent the SNES Mario games, but for my dollar, I have to go with Yoshi’s Island. This was this one of my favorite games of the 16-bit era, and it stood out in many ways, from the awesome art style to the polished gameplay to, of course, the soundtrack, which was a bit different from what you might expect from a Mario game, yet still exceptional. I’m choosing a song that works for me on a lot of levels, but the main one is that it’s not just a great song, it really feels “different” to me than almost anything else I have heard in video games. And it hits you very soon after starting the game, setting a nice tone for what is to come. The Legend of Zelda series has a lot of games that get a lot of praise for their soundtracks, and for very good reason. I might even go so far as to say that the series is one of the industry standards for excellence in soundtrack design. A Link to the Past is no exception, and it mixed plenty of original tunes with some nice remixes of classic Zelda themes. A Link to the Past is one of my favorite games of all-time and the soundtrack did not disappoint. I know that most people (at least, those of us old fogies) probably hear “Zelda theme” and think of the main overworld theme from the original Legend of Zelda game, an icon of video game music. However, to me the A Link to the Past Dark World overworld theme is always the first one that springs to mind, and it may just be my favorite Zelda song. And yet another Squaresoft RPG on my list. It won’t be the last. Chrono Trigger was a sprawling time-traveling epic, and the soundtrack matched the game perfectly, from the bouncing beats of the caveman days to the tech-infused sounds of the future. Each of the main characters had their own theme as well, and pretty much every one of those themes was awesome. There is a world up in the sky in Chrono Trigger, and it is a very strange and solemn world. When I first walked into it and heard the theme for that area, it took my breath away. Chrono Trigger has a ton of awesome music, but I had to go with Zeal. Secret of Mana was the first RPG that I ever played, so maybe the nostalgia factor works into this choice a bit. Just a bit. I suspect that most people wouldn’t put this game’s soundtrack quite as high as I am doing, but I don’t care; it’s one of my favorites. No matter how you look at it, the fact remains that Secret of Mana has a stellar soundtrack, and it helps you get lost in the beautiful world of Mana. You won’t hear the song I chose until the last area of Secret of Mana, but it is well worth the wait. An excellent way to close out what was a spectacular game for me. What is this? An RPG that wasn’t made by Squaresoft in my list? Heck yes! Those who have played Lufia will know exactly why this soundtrack is so high up on my list. Those who have not; I pity you, for so many reasons. Lufia had one of the most epic and emotional storylines of any SNES RPG, and the soundtrack made me feel every single moment of it; from the the lighthearted moments to the crushing tragedies, and everything in between. This song brings me to tears, in part on its own terms, but also because of what happens in the game while the song is playing. Lufia was one of the first games to show me that games can excite powerful emotions in us, and this song helped drive that point home. The original Donkey Kong Country had me drooling over its graphics months before it released, but it wasn’t until I got my hands on it and cracked into that sucker that I realized that the soundtrack was equally as stunning. I would not have thought that the sequel could top it in the music department, but it did, and then some. Donkey Kong Country 2 has some of the most emotional music that I have heard in any medium, which is kind of hilarious if you think about it, considering that it is a game about a primate collecting bananas. Was there really any choice in what song I would pick to show off the Donkey Kong Country 2 soundtrack? Way up in a bramble-filled sky this song appeared and oh man... it changed the way that I viewed video game music. I used to turn the game on and play the corresponding stage over and over and over just to hear the music play. This is often considered one of the greatest video game songs of all-time, and it deserves that acclaim. From the moment the title screen booted up and the hauntingly chilling music began, I knew that I was in for something special with Super Metroid. This may very well be my favorite game of all time, and this is in no small part to the immersion factor. Modern games may claim higher levels of immersion, but I will put this 16-bit gem against any of them, any time. Samus Aran was an isolated women on an alien (in every sense of the word) planet, and the soundtrack made me feel her plight in my bones. I was tempted to chose a darker song to capture the eerie tone of Super Metroid a bit better, but in the end I had to go with my gut, and give you my favorite song from the game. It plays in an area with lush forestation all around you, and I think it fits pretty well. I mentioned above that punk rock is one of my major influences. Well, Mega Man X music is essentially punk rock music in video game form, and how could that not be awesome? Ripping “guitars”, crashing drums, pounding bass lines, dual lead harmonizing solos; this is some seriously intense stuff. And it was all topped off with some raw emotion infused into the mix. I struggled between choosing X or X2 for my list, as both of them have spectacular soundtracks that should not be missed out on, but in the end I went with X. The Mega Man X soundtracks have probably influenced my music more than anything else in the world. I’m being totally serious here, and if you have heard any of my music, you know that I speak truth. To show off this stellar soundtrack, I had to pick the first fortress stage song. This song manages to be super emotional and totally rockin’ at the same time, which is a rare combination indeed. And I can remember how different this song felt after the erm... mid-stage event. Something major happens which leaves you in a different emotional mindset than when you started the stage, and this song captures the mood perfectly. So there you have it, my top 10 SNES original soundtracks. Do you agree? Disagree? Why not list your top 10s?! And don’t forget to check out my Top 10 NES Original Soundtracks (OSTs) as well! Man, its like 200 bucks!! What in the planet. --I just had an awesome idea. You guys who own Earthbound should totally send it to other NW dudes. It'll be like a library book (or a loose woman in a Fraternity House!!)! Pass it around, boys! Ha ha. Come onnnnnnnnnnnn guys. Loaner! Permanently. I can't get enough of the midi instrument "Orchestral Hit," and most of my SNES favourites include liberal use of it in their soundtracks. I will wait patiently, centuries if I must, for its glorious return. Phoenix Wright brings it back in style! Edit : trying to link some UN Squadron/Area 88 ost here. "site not recognized"... C'mon, it's Youtube, just like every other video here. This game is a masterpiece. From intro to credits, everything screams high quality. The 3 basic difficulty settings cover a range wide enough to allow kids and veterans to have the same old-school bullet-herding fun, but the hidden difficulty... oh dear, if you think the late 90'sbullet-hell trend made shooters harder, you might have to rethink your opinion. The game turns into a nasty half-skill half-memorizer challenge that throws endless clusters of really REALLY fast bullets at you, then pounds you to the ground with a couple unfair boss fights (the Seaviet...). The game has many cool things that you won't see in any other shooters, like mission selection, a clever health system and a money and shop system.There's some slowdown here and there but that's the price you have to pay to play a shmup on the SNES (Compile's Super Aleste/Space Megaforce being the exception). I never understood the hype around Genesis shooters, sure the processor is more powerful, but even the classic Thunder Force III suffers from meh readability thx to the console's limited palette. And when it comes to soundtracks and atmosphere... Capcom and Konami (who's surprised ?) are miles ahead of the other early 90's devs with UN Squadron/Area 88 and Axelay (same composers than SCIV). Both soundtracks are way underrated honestly. BTW, first post, hi everybody, english isn't my native language so feel free to correct me if I'm butchering your grammar, I can't improve if nobody points my mistakes ;). Gotta throw some love at Zombies Ate My Neighbors! Classic retro-60's horror/sci-fi B-movie goodness. They got what made this era's genre pieces so memorable. If you click the little question mark on the far top / left of the area that pops up when posting, it shows how to insert videos. It's a little convoluted but you get used to it quickly.